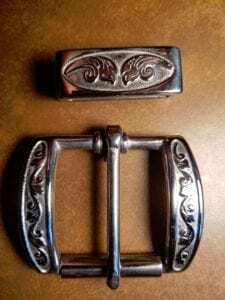 This Western Buckle was designed and patented by Ted Blocker aka Shaniko Buckle Set. This Buckle set fits 1 ½” belt. They come in Solid Stainless Steel and Solid Brass. 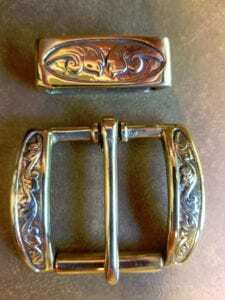 This is a heavy western buckle set with roller. This is a very unique buckle that cannot be found anywhere else. We have sold many of these Buckle sets at $50.00 each. We are offering them to our Blocker Ranch customers at a special price of $25.00.